There are a few additional steps to take when it comes to the Medical Device Single Audit Program (MDSAP) and ISO 13485-2016 regulatory process to get appropriate marketing clearances or approvals. If you go through a regulatory process and get a product cleared, you still need to make sure your product is properly registered with the appropriate regulatory agencies. These extra steps to actually sell your product can be complicated. 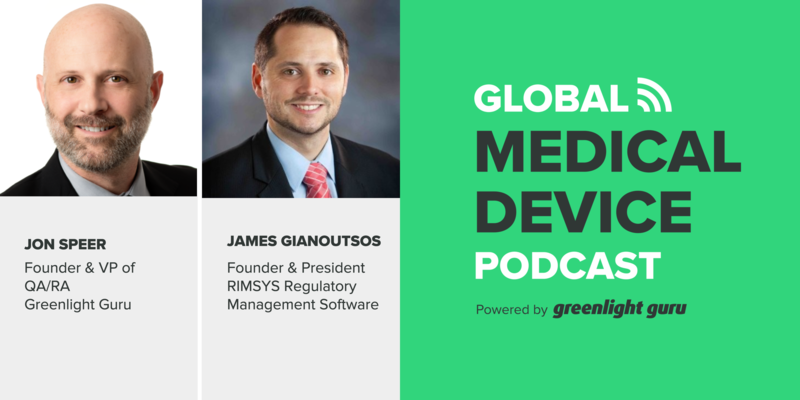 On today’s episode, I talk to Jim Gianoutsos of RIMSYS Regulatory Management Software, about how to improve and streamline the device marketing authorization and facility registration process to gain efficiencies. To be a global leader or company, you need to have a solid system in place to manage marketing authorizations worldwide. As part of the MDSAP process, you’re expected to answer specific questions and show evidence of compliance. Your regulatory team may be perceived as a bottleneck. Everyone needs to be on the same page about when the product can be released. Connection between marketing authorization and facility registration required for various countries - United States, European Union, or elsewhere. Get organized, have systems in place, and stay in compliance in case an auditor comes through your door or if you plan to sell in particular markets. FDA is moving away from 21 CFR 820 regulations to adopt ISO 13485 as quality system requirements via an MDSAP audit. Small companies have too much information to maintain, organize, and track. Large ones may have resources, but suffer from miscommunication. Don’t be complacent or afraid to change systems. RIMSYS was created to help regulatory professionals successfully and efficiently handle documentation. 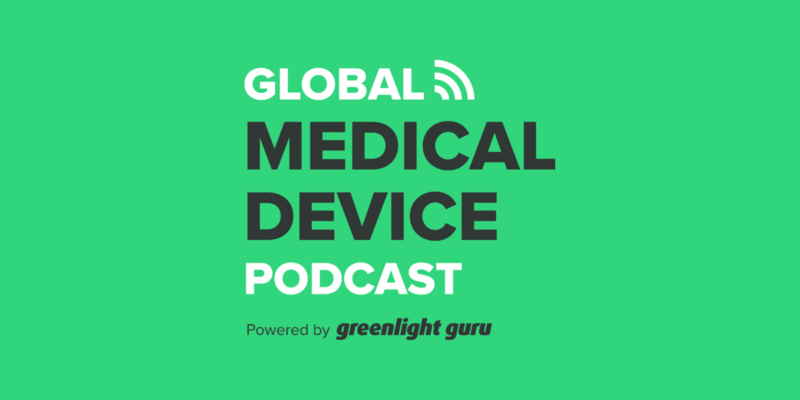 Jon Speer: Hello, and welcome to another exciting episode of The Global Medical Device podcast. This is your host, founder and VP of Quality and Regulatory at Greenlight Guru, Jon Speer. And today, I have a guest, Jim Gianoutsos, with RIMSYS, Regulatory Management Software. Jim, welcome to the Global Medical Device podcast. Jim Gianoutsos: Thanks, Jon. Thanks for having me. Jon Speer: Well, today, you and I are going to talk a little bit about MDSAP process, but specifically, device marketing authorization and facility registration. I thought we would dive into that topic a little bit. Since there are some things that, first of all, do people realize how important this is? I think that's probably an important thing to dive into a little bit. And then we can talk a little bit about some of the details and the nuances and why this matters, especially if I'm a company with products that are all over the world, why do I care about this? I guess before we dive into some of the details, can you give a little bit of a high level overview of what MDSAP device marketing authorization and facility registration is all about? Jim Gianoutsos: Yeah, sure. Yeah, so right off the bat, obviously, MDSAP is the hot button topic, and everybody's trying to figure out where it's going to go. And one of the biggest things regarding it is that device marketing authorization and registration for the facility. And why it's so important is that, well, there's seven chapters in the auditing program within MDSAP. One of those is specific around marketing authorization and facility registration, and then it touches on two other chapters as well, management and design development. And so you have this auditing scope that you're going to go through with your auditor, and they're going to be specifically looking for how you have managed your registrations, have you submitted the correct documentation, do you have a system in place to have the product release and to ensure that all of your regulatory information is up-to-date and appropriate, and if you received the marketing authorization from that specific jurisdiction, the Health, the Ministry of Health from that country. Jim Gianoutsos: And so, you have to have this system in place prior to an audit, an auditor coming into your facility. And you also have to have that information organized in a meaningful way that you can get to it quickly and show from, and objectively, that you fulfilled the requirements of MDSAP and all of the country regulatory requirements that fall under MDSAP program. That also goes hand in hand with ISO 13485:2016 is you have to have some type of proper release of your products in the appropriate jurisdiction. So it kind of all goes hand-in-hand with, basically, if you're trying to be a global leader or a global company in this day and age, especially right now, you need to have a solid system in place in order to manage those marketing authorizations worldwide. Jon Speer: Okay, so folks, let's simplify it just a little bit. When we talk about marketing authorization, so if you go through a regulatory process, and you get your product cleared, or approved, or granted, or whatever pathway that you go, either through FDA or CE marking, that's a critical step, of course, but then there's another step that you need to take, and that is to make sure that your product is properly registered with the appropriate regulatory agencies, and that's really what we're talking about when we're talking about marketing authorization. Just getting the clearance is one thing, but you got to make sure that you've done all the other steps in the process so that you can actually sell your product in those markets. I mean, am I understanding things correctly? Jim Gianoutsos: Yeah, absolutely, and yeah, for sure. Jon Speer: And we talked a little bit about MDSAP in the past, and we're mentioning it here today. And I think this is important, and I'll explain some things that I want people to be aware of here, in a moment, but for those who... A lot of companies are going through MDSAP audits for a variety of reasons. We won't dive into those today, but if you're going through an MDSAP audit, you talked about you needed to have the system in place and all the documentation and the evidence there that... But what should I expect as I go through an MDSAP audit? What should I be expected to present or demonstrate to prove this? Jim Gianoutsos: Yeah, sure. That's a great question. And so, MDSAP has a very rigid process in terms of how auditors are supposed to come into your facility and audit according to each of the regulations for the participating countries. And so, whenever you go through that auditing process, they appoint questions that they are required to ask you, and then they're also supposed to get the objective evidence to show that you obviously comply with those questions and those requirements. And so, when an auditor comes in your facility, they're going to specifically want to know, do you comply with the requirements to register and license your device facility? Did you submit the device's information to the appropriate regulatory authorities? And did you obtain the device marketing authorization in the companies you are selling? Jim Gianoutsos: And so it all goes hand in hand with basically having a controlled process, a good quality management system in place, a good product realization process, a design development process, that you can have in place within your manufacturing facility and properly release the products for sale or commercialization in those countries. And so, if you don't have a system in place, you might get to a certain phase or design phase of your product launch, it might be all great from a verification and validation standpoint, and you're ready to go. You're ready to start selling this product. Sales team's ready to go, marketing team ready to go. But hey, you got this regulatory team that might be perceived as the bottleneck because they're actively submitting that documentation to the appropriate regulatory authority to get that prospect approved at market. Jim Gianoutsos: And so you all need to be on the same page in terms of, when can you really release that product? It might be all great from a design standpoint and from a good marketing standpoint. But your customer service and your sales team and your regulatory team need to be on the same page for that go-to-market strategy. And that's really where that system goes hand-in-hand, and that's really what the auditors are looking for, to make sure that you have a process standardized or something to that effect, implemented and established in your facility and within your company to control the release and in marketing authorizations of those products. Jon Speer: Alright, so I'm following that pretty well. Now, when we talk about 13485, obviously, there is, if you're going through an MDSAP path, there's a strong correlation obviously with 13485 from that audit perspective, but I guess more specifically, I know that 2016 version of 13485 added some explicit language about meeting local regulatory requirements. I'm very much paraphrasing that particular clause, but can you talk a little bit about the connection between marketing authorization and facility registration and how that is essentially required as part of ISO 13485:2016? Jon Speer: Meaning MDSAP, right? Jon Speer: Yeah, okay. Right. Right. Jim Gianoutsos: Yeah, yeah, sorry, sorry. And then, but in order to sell into a couple of countries, they accept the CE mark as that could form the assessment route into meeting the requirements of that country. So you're really meeting the requirements or have to meet the requirements of 13485, and MDSAP to sell into those countries and receive that marketing authorization. And to your point, Jon, having the, meeting the local regulatory jurisdictions and requirements are a must. Not only that, but if you're selling out of the US, you have this, not little law, but this little caveat that says that you must meet the requirements of the importing country. That means it's really broad in that aspect. That means, no matter where you sell out of the US, you have to meet the importing country's requirements for marketing authorization. And so you need to be on point and make sure that you have a robust system in place that upon that product release, you're meeting those specific requirements, and you have a mechanism in place to ensure that you don't release product prior to being properly registered. Jon Speer: Alright. And so, I think some key things for the listeners to take home on this is, if you think you're just focused on the US, that this doesn't matter. That's not true. And it's still applicable to you. If you think that you're going to sell your products outside the US, and your base is in the US, still that need to meet that requirement. And if you're 13485:2016 certified, or plan to become 13485 certified, but don't plan to sell into the EU, this topic is still a concern because there's that clause that you have to demonstrate that you're meeting the local regulatory requirements. There's very few words in the regulations or in the ISO requirements, that it's not super expansive as far as is it's just a few words, but those few words make a big, big difference. Jim Gianoutsos: Yeah, they certainly do. And at the end of the day, if an auditor comes in, and they get a sample of products that you're currently selling and maybe it isn't into a country that they're really supposed to be auditing right, if they find something wrong with that, well, that's a systemic issue at the end the day. And you can draw that parallel saying that you don't have a controlled process. And that means that not only are you going to be in trouble for that one country, but you're going to be in trouble for the MDSAP audit that you're participating in. So, yeah. Drawing that correlation is definitely a real thing. Jon Speer: Yeah. I mean, this, not doing this or not addressing these needs, I mean, this is essentially a blocker for those particular geographic regions. This is a serious thing and why we're talking about this. Obviously, there's been a lot of work that's been done in recent months in the MDSAP realm, as well as in 13485 over the past couple of years. But I guess just a couple of thoughts as to how and why I need to get organized now. Is there something that's pushing me? Is there some deadline? Is there some criteria that I need to be focused on? Jim Gianoutsos: Yeah. At the end of the day, if you don't start getting organized now, MDSAP is going to be the way that things are going to be moving towards now, right? And it's all about the harmonization. It's all about trying to make auditing standardized, regulatory requirements standardized. And so, if the big players are saying you got to do this, then that means that's how things are going to be from a regulation standpoint. If you don't start getting organized now, and you eventually want to start selling into these countries, you're going to have a couple of stage audits that you're going to have to go through. You're going to have to make sure that your systems are in place to handle the amount of work that your regulatory team in your business is going to have to tackle on a day-to-day basis. And so, starting that process now is going to help ensure that you have some type of system in place, should that auditor come into your facility or should you plan on selling into those particular markets sometime in the future. Jim Gianoutsos: A regulatory professional's job is worldwide nowadays. And so, it's a lot of responsibility and a lot of business risk that you're essentially putting on their shoulders. And you can't have that all on that team's shoulder. It has to be a fundamental process, standardized process, ingrained into your quality management system, that you have to have in place in order for you to not get any compliance issues, any audit non-conformities, and to have a standardized process to ensure that you're releasing good product into the market and also maintaining any changes to that product while it's already on the market. Jim Gianoutsos: One of the requirements is, not only that you get the marketing authorization, but you stay compliant when you're already in that market. And so you have to constantly be monitoring for expiring registrations, any type of design changes with your product and how they affect your marketing authorizations when into these countries. And so, from a quality management system standpoint, you have to have a good change control process in place that ties directly into your regulatory team in your regulatory processes. If you don't have a good regulatory process now, you're not going to have one later. It's going to be too late, and the amount of information that your regulatory team has to handle on a day-to-day basis is a ridiculous amount. It's too much to handle alone. And that's really where you have to develop those systems now. Jon Speer: Folks, I'm talking to Jim Gianoutsos. Jim is with RIMSYS Regulatory Management Software, R-I-M-S-Y-S. And you can find more about RIMSYS at rimsys.io, R-I-M-S-Y-S dot I-O. And I like what Jim's saying here because I think it's always been the case, at least in my opinion, in the time that I've worked in the medical device industry, that there is a quality and regulatory... They're not quite joined at the hip, but there is certainly a strong relationship or correlation between quality, your quality management system, and regulatory practices. And what I'm hearing Jim say, and I'd like to echo, is that now more than ever, these, your quality and regulatory systems, they have to be integrated with one another because you're in a... We're in a point in time where you really need a single source of truth, where all of your quality management system processes, procedures, records, data and information are kept and maintained in a single location. Jon Speer: And that's one of the things that we have built at Greenlight Guru, is an EQMS software platform that is specifically designed by medical device professionals for the medical device industry, and Jim Gianoutsos and RIMSYS are partners of ours at Greenlight Guru. So, be sure to check out more about RIMSYS by going to rimsys.io, and you can learn more about Greenlight Guru by going to greenlight.guru as well. Jon Speer: I want to revisit the MDSAP piece a moment, because timing, I think, is important for people to realize. And you said something about how this is... And I'm paraphrasing you a bit, but MDSAP is sort of the wave of the future with respect to how auditing and the harmonization is going to be done, and we know that essentially starting January 1, 2019, if you're selling products into Canada, it's not optional. So, folks need to pay attention to that, if you're interested in the Canadian market. You're going to need systems in place to be able to address a marketing authorization very, very soon. You're going to have to go through an MDSAP audit very, very soon, if you're going to stay in Canada. Jon Speer: But the reason I bring up MDSAP as well, and there's a tie-in here to 13485. I'm going to try to throw a couple of ideas out to the audience and, Jim, I'm interested to hear your response. But FDA has publicly announced several times in the past several months, that FDA will be moving away from the 21 CFR Part 820 regulations and adopt ISO 13485 as quality system requirements. So, that's key. And if you think about what Jim said a moment ago, MDSAP is a program that FDA is very much a part of. And so, if you think about how audits will be done in the future with FDA, all the writing seems to be on the wall, that it's going to be 13485, and it's going to be via an MDSAP audit. I don't know if you have any other thoughts or comments about that. Jim Gianoutsos: Reformatting it and resubmitting it, so it's definitely a need, and it's definitely the wave of the future, and at the end of the day, you... We got to start preparing for this 'cause this is the way it's going to be moving forward. Jon Speer: Yeah, and I've talked to a few folks, and they're like "Oh, that's a long ways away." And I'm like, "No, it's not a long ways away." Jon Speer: I mean, you may think so, but regardless, now is the time to start to build your systems to align with that. And if you think it's a long ways away, keep in mind, the MDSAP program, it's been around for quite a few years. Keep in mind, programs like Case for Quality have even been around for quite a few years. And if you think about MDSAP and Case for Quality, these are both mechanisms, if you will, or vehicles, if you will, that FDA has spent a lot of time, thought, and effort, and energy into defining and refining over the past few years. For this moment, that switch could be flipped to 13485, I'm not going to say seamlessly, but pretty easily. Everything that I'm reading so far says that FDA will to start to communicate that transition as soon as 2019. My prediction is that this will go into effect by 2020. Of course, there will be some transition and all that. A lot of details to be worked out, but it will happen pretty fast, folks, so don't think you got plenty of time to deal with it. Jon Speer: You also talked a little bit about the job of a regulatory professional today is, and maybe more complicated now than it's ever been, and I'm happy about some of these harmonization efforts from the regulatory agencies to hopefully streamline that a bit, but even so, there's still going to be a demand for marketing authorizations. You're still going to have to go through these necessary channels. And I wonder if you can compare and contrast, 'cause our listeners, they run the gamut from early stage startups that are bringing their first product to market, to companies who have dozens and dozens of products in their portfolio and in sites all over the world. Can you compare and contrast the two ends of the spectrum, of what stress and strain this type of issue is going to present to regulatory resources and in those different types of companies? Jim Gianoutsos: Yeah, sure, so, it's a vast difference between a small company and a larger organization. You might have one regulatory team member trying to make this company global, or your company global. You have a small startup. You're in one market. You're trying to get in a few other markets. And at the end of day, it's not feasible because of the amounts of information that you have to maintain and organize and track. And sometimes, you might be the only person doing that, and that was me a few jobs ago at a really small company. And it was just completely unmanageable. Jim Gianoutsos: When you have a larger organization, where it's a team effort, right, then you start getting into other problems. You might have the resources, but then you have that miscommunication, and you can't collaborate together on the issues that are the most pressing or most relevant. You lose that critical archive of information whenever a teammate leaves, because at the end of the day, they might be the only person that's responsible for your specific product in that market, and you have to then retrain people or try to reinvent the wheel, in terms of figuring out how they got in there, who they worked with, and what type of documents they needed to submit. Jim Gianoutsos: There's an interesting stat, actually, by RAPS, Regulatory Affairs Professional Society. It says that 70% of all North American regulatory professionals, 74% to be exact, work worldwide into different countries, and then in Europe, it's 66%. And so, you have your regulatory affairs team that's supposed to be managing all of these products globally. That is a huge undertaking. That is a huge responsibility and a huge business risk at the end of day, because your team is inherently responsible for ensuring worldwide compliance with your products. Jim Gianoutsos: And so, organizing that information, and managing that information, and making your team more efficient is a critical nature of the regulatory landscape in today's market. And so all that time that you're wasting looking for the information, trying to figure out what that information is, trying to reinvent that or recreate that information, you got to get more efficient, because at the end of the day, throwing more bodies at the problem doesn't solve the problem. You need a system, a standardized process in place now, and you got to start working on it today. Jon Speer: And Jim, I mean, you've solved this problem for the industry. Jon Speer: I guess, talk a little bit about the high level of the RIMSYS platform. And folks, I do want to encourage you, if you are dealing with product registrations anywhere in the world, frankly, any number of products, keeping up to date with the local regulatory requirements and standards, and all the changes, because they do happen, and they're going to continue to happen, that could be a full-time job by itself. I mean, you might have picked up, Jim said he worked for, he did this for a small medical device company, and it consumed a significant amount of his day-to-day time. But talk a little bit about RIMSYS, and how this can help the regulatory professional. Jim Gianoutsos: Yeah. Thanks, Jon. Yeah. That was the whole point of creating RIMSYS, was to have this regulatory information management system that regulatory affairs professionals can use to organize, maintain, and collaborate with, together with internal and external stakeholders, whether that be in country sponsors, authorized representatives, distributors that are handling the registration process for you, within that particular market, or just maintaining the documentation that's needed to submit into a particular market. And so, building out the, again, that critical archive information, keeping the notes and the tasks all organized into one system, really understanding the decisions that are made along the way. What worked? What didn't work? Is the real fundamental underlying reason that we created RIMSYS. Jim Gianoutsos: And so, I've worked for very, very large organizations and very small organizations. And everybody thinks that the big guys have it figured out, and I can tell you first hand that they don't. I know this personally, because I've worked there. I've worked there as a consultant. I've seen first hand the amount of information that they've given me, and in the way they've given it to me, in color coded Excel spreadsheets that they're trying to manage 2,000 products in 100 different countries. Jim Gianoutsos: Yeah. It's mind blowing. And managing when expirations expire by product and by market with Outlook reminders. What if that person leaves your organization? Who's going to pick up that slack? You have to transition their Outlook calendar onto you. I mean, it's mind blowing that there isn't a system out there to help these companies succeed in the regulatory landscape, in the regulatory environment. Jim Gianoutsos: And I have a really interesting figure here, actually. It's right out of a Deloitte consulting paper, and it says 30-50% of a regulatory team member's time is wasted looking for information. If you think about that for moment, 30-50% of one regulatory person's time is wasted just trying to get organized with the ridiculous amount of information that they have to handle on a day-to-day basis. If you want to talk about wasting money and throwing it down the drain, look no further than that figure. Regulatory affairs people aren't cheap. They have master's degrees, they have technical engineering degrees. This is a very real thing and a very real big problem in the industry right now. And right now, this is a consultant's dream because, really, nobody really knows what the heck they do, and so they're hiring consultants to try and figure it out. But RIMSYS, at the end of the day, was to help empower the regulatory team that you have in place today and to help them get organized, to help manage registrations, to help manage standards, to help manage your essential requirements needed in order to enter a market and maintain all of that for you, and proactively monitor and keep you up-to-date and then notified, should anything change. Jim Gianoutsos: I know because I was doing it. [chuckle] I was doing it, and I know first hand how much administrative work that I was doing just finding it. I could certainly say at least 25% of my time was spent just finding information. Jon Speer: Yeah, which is crazy, 'cause if you're going to gain more capacity to manage more products and more registrations, and you hire another person, the best you're going to get is 70-75% of a person, because of all the administrative work. It's just crazy. And I think, Jim, obviously, you and I have known each other now for a couple of years, and Greenlight plays a little bit in the quality space and RIMSYS, obviously, in the regulatory space, but I think one of the things that I've picked up on that we, as quality and regulatory professionals, we have accepted a lot of complacency in the tool sets that are available to us. Jim Gianoutsos: It's just that everybody is comfortable where they're at, and they're afraid to change what they're doing because of the potential consequences, or perceived consequences that they think might happen should they change something. And I can tell you first hand that if you don't change something now, and you stay with the systems, the old systems, the spared systems, the Excel spreadsheets, the color-coded Excel spreadsheets, and the Outlook reminders, that that's going to have far more reaching consequences than it would if you were to get into a newer system or some type of system that was specifically designed for medical device regulatory affairs professionals and medical device manufacturers, that was designed by regulatory affairs professionals to help you guys out, to help them out. Jon Speer: Well, that's pretty good. Jim Gianoutsos: I don't know what else. Jon Speer: But our world is changing. And yes, there are significant, exciting developments in the realm of harmonization, and I think in part of because of that, that emphasizes the need for more state-of-the-art and better solutions to manage, not only our product data and information, but also our quality systems, as well. Jim, any other final thoughts before we wrap up this episode of the Global Medical Device Podcast? Jim Gianoutsos: I think we covered a lot, and I think it was all great topics and discussion, and I just want to follow up with a quick case scenario, a real life scenario of what it's really like sometimes being the bad guy. And I go back to working with the company, and there was a product that we were trying to sell into a country, Saudi Arabia, to be the exact. And we didn't have the proper marketing authorization, but the CEO wanted sales. And so, sometimes as regulatory professional, you have to make those decisions to not do something. And as a matter of principle and ethics, and as a professional, you have to make those decisions to push back on people. And those are real life scenarios and it's as a real life case example of somebody that doesn't really understand the regulations, and the laws, and the requirements needed to be complied to from a regulatory standpoint. Jim Gianoutsos: And so, it's our job as regulatory professionals to start educating and to start discussing those points to make sure that manufacturers and people within your organization understand the rules. And these rules are enforced, and the way they're enforced is by these audits, the MDSAP audits that are coming to fruition pretty fast right now with ISO 13458:2016 and any other harmonization laws or guidelines or regulations that are going to be coming out in the near future. And so, you have to get organized. You have to get your team in place now, and your processes in place now, to start collaborating and get everybody on the same page, because without that, you're going to have those type of scenarios where people just don't understand why we do the things that we do and why it matters. Jon Speer: Yeah, that's well said. And I appreciate you sharing that example. Folks, I have a homework assignment for you, especially if you're a regulatory professional. You got to reach out to RIMSYS. Go to rimsys.io to learn more, and you can reach out. They have great information on the website. You can learn a little bit more about the product, and of course, you can always contact Jim and his team for a demo and more information about that, but you have to go there if you're a medical device regulatory professional because this is... This is going to... I promise you, this will change your life in a good way. Jon Speer: Jim, thank you so much for being my guest on the Global Medical Device Podcast. And folks, as I mentioned as well, quality management system, it's changing too. And if you haven't revisited your quality management system in the past few months, there's a good chance you're behind. And so, I would encourage you to learn more about state-of-the-art, latest, greatest, and solutions designed specifically for the medical device industry. Just head on over to www.greenlight.guru. Learn more about our platform, and if you're so inclined and would like to learn more, same sort of thing, you can contact us, and we'd be happy to schedule a call and a demonstration of the Greenlight platform. As always this is your host, the Founder and VP of Quality and Regulatory at Greenlight Guru, Jon Speer, and you have been listening to the Global Medical Device Podcast.